After a devastating nuclear war, six human factions are seeking shelter in the Centauri system. On the verge of extinction, the humans are saved by a superior civilization, allegedly the Centaurians, and each faction is given a fresh start on a new planet. Thus the exodus of humanity seems to have ended on the planets orbiting the star called Proxima Centauri. When the Centaurians announce their departure, the struggle for power commences once again. 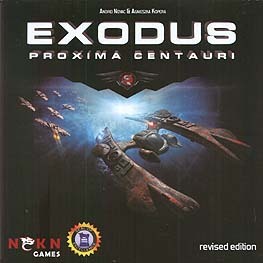 In Exodus: Proxima Centauri, the six factions fight for dominance in an epic empire-building game, striving to build a new human empire on the ashes of the Centaurian civilization. Each player will build his own space fleet of customized ships and conquer new planets, fight the Centaurian Resistance and the other players, negotiate and vote for political decisions, research Centaurian technologies, and much more.